This is a labour of love, Selina Cadell and Eliza Thompson’s inaugural production for their newly formed OperaGlass Works for which they raised all the funds, a cool £145,000. 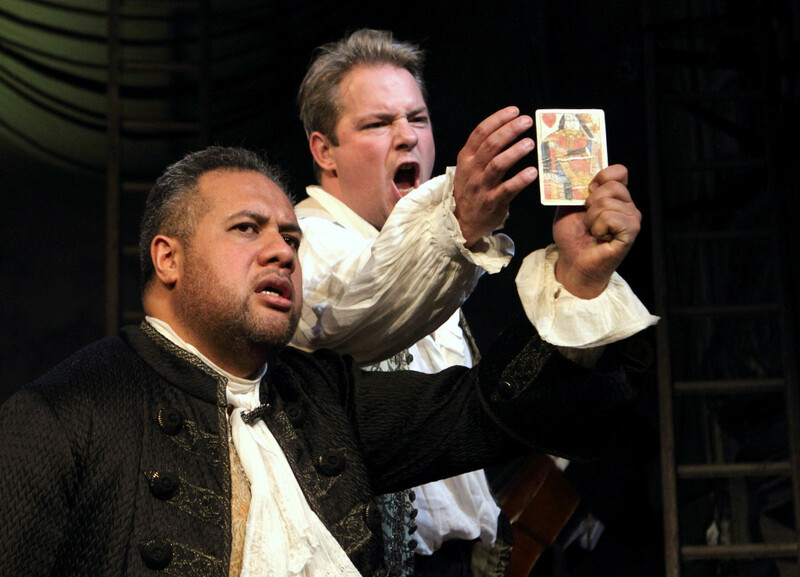 So cheers to them and the international cast they’ve assembled that includes Grammy award-winning New Zealander, Jonathan Lemalu, Royal Opera House Young Artist, Robert Murray and with Laurence Cummings, MD of the London Handel Festival and the Internationale Händel-Festpiele Göttingen in musical charge. Cadell’s particular passion is to encourage more `naturalism’ in opera singing – a cause also close to Peter Hall’s heart back in the late 1960s and early ‘70s. Cadell’s choice of Stravinsky’s 1951 The Rake’s Progress with libretto by W H uden and Chester Kallman certainly lends itself to this approach. Like Mozart’s Marriage of Figaro, it’s not an opera that `stands on ceremony’ but to an extent, carries its heart on its sleeve in the journey of young Tom Rakewell’s journey from blissful ignorance to insanity. A Faustian pact by any other name, Stravinsky based his opera – the only one he created – on Hogarth’s famous paintings. Stravinsky, in apparently a new departure for him according to Thomas Adès who conducted it at Covent Garden in 2008 in a production directed by Robert Lepage, harnessed the recitative style of the 18th to a `contrapuntal technique, a linear understanding of harmony that he was able to take forward into the serial, 12-tone music he wrote after The Rake’. © Catherine Ashmore, Robert Murray as Tom Rakewell on the razzle in London at Mother Goose’s brothel. With members of the Trinity Laban Conservatoire chorus. But to a fresh ear, it’s comes over as a strange mixture of the traditional and beginnings of modernist atonality. Lyricism comes in short bursts, most notably towards the end of Tom’s journey when lured by Nick Shadow’s promise of first, easy money, then happiness, his world falls apart when `old Nick’ demands his wages for services rendered – in other words, Tom’s soul. Acoustically, this Rake’s Progress sits very well in Wilton’s wonderful, stealthily restored music hall. Lemalu particularly as Shadow impresses both with the richness of his singing and an acting style that fully conveys Nick’s devious motives. Robert Murray in the long and demanding role of Tom presents him as a delicately toned, sensitive character whose most convincing moments arise in his downfall. His singing is always pure and unaffected. © Catherine Ashmore, Victoria Simmonds as Baba, the bearded lady, and chorus. 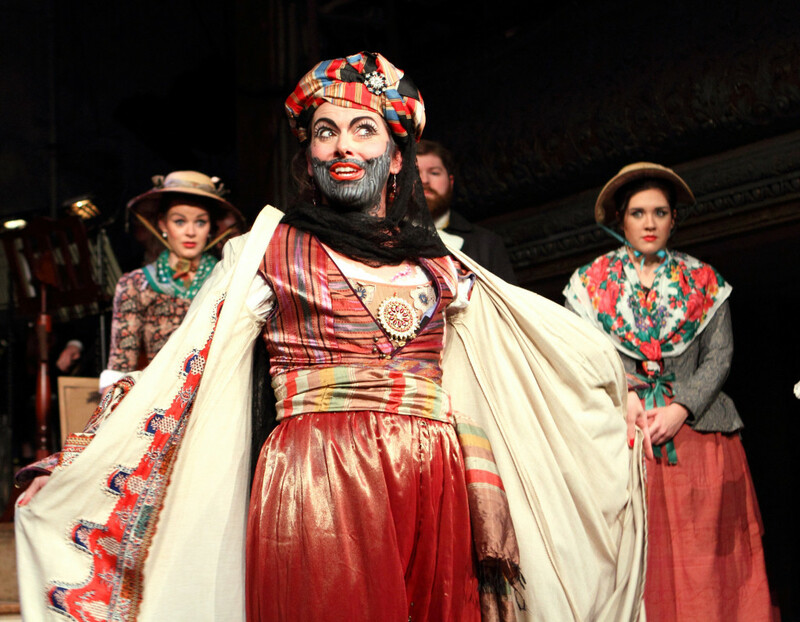 As a production, there is plenty to keep the eye and ear attentive – Victoria Simmonds scores a particular triumph as the bearded lady, Baba the Turk whom Tom finds himself married to for a short time. But, for my money, it carries neither the emotional force or captures the dramatic quality of the Hogarth originals that so inspired Ninette de Valois and Gavin Gordon in their Rake’s Progress ballet, created in 1935 for the Vic-Wells ballet and unforgettably performed in the Royal Ballet Touring Company’s repertory by David Wall. In this Stravinsky/Auden/Kallman Rake’s Progress, Tom dies of a broken heart when his early love, Anne, visits him in Bedlam then leaves him. 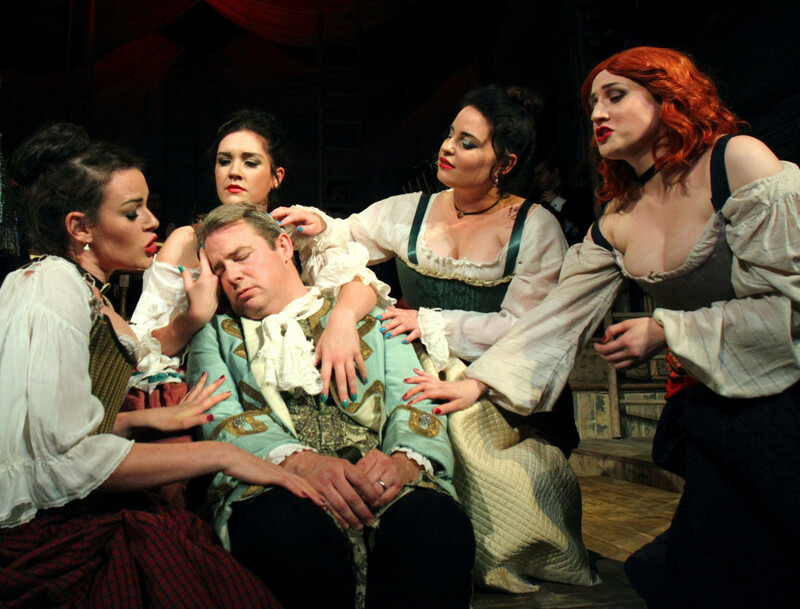 The epilogue carries the lesson that `the devil finds work for idle hands’ – a warning one can imagine in a different production that might have made a stronger satirical as well as moral impact. Here, its significance passes fleetingly. 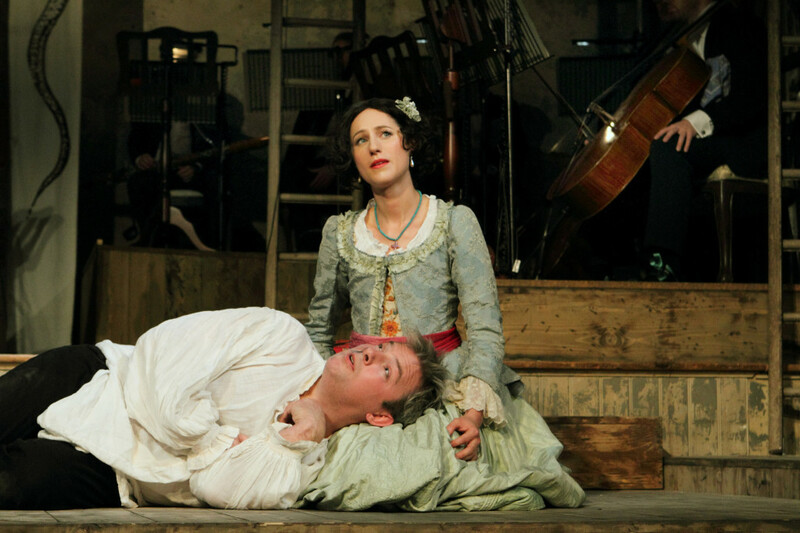 Wilton’s sold out audience, opera buffs to a man and woman, nonetheless clearly took the production, the cast and orchestra, to its heart applauding it to the ceiling. This entry was posted in 2017, Reviews and tagged Eliza Thompson, Igor Stravinsky, inaugural production of new opera company, opera based on Hogarth, OperaGlass Works, Selina Cadell, tale of dissolution and insanity, W H Auden and Chester Kallman, Wilton's Music Hall on November 25, 2017 by Carole Woddis.